The Amharic Project: Words, Words, Words. 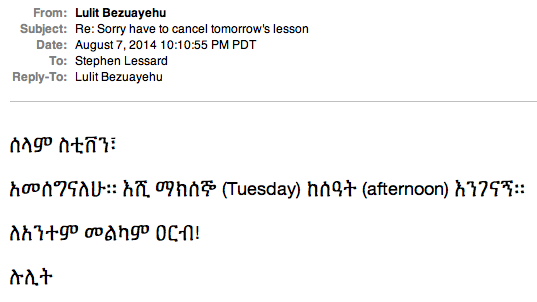 Increasingly, more of my email interactions with Lulit, my language teacher, happen in Amharic. Lulit still needs to alert me to new vocabulary, but I can tell she's trying to make frequent use of words I already know to build my confidence. Early on, we decided to communicate using the Amharic fidel (ፊደል, "alphabet" or "letter") rather than transliterations of Amharic words. In this email, Lulit confirms our next lesson and wishes me a happy Friday. This is not necessarily the norm. Lulit had a student for three or four years who never learned the script. Lulit showed me a text message exchange between the two of them, with even identical Amharic words spelled differently. There is no standard system of transliteration for Amharic, so words can be rendered any number of ways in English. I've seen the word "ፊደል," for instance, spelled fidel, feedel, fidël, and fidäl, and there are probably other variations. Lulit is glad I am communicating with the ፊደል so she does not have to constantly decide how to spell the words she uses. I figure if I'm going to tax my brain anyway, I might as well do it up front and learn the script. But even if Lulit's former student had learned the ፊደል, he could not have used it to text Lulit. While the Amharic script can be used on Apple laptops, the company does not support it for the iPhone or iPad. Lulit is starting a formal petition to get that changed, but in the meantime I sent my individual feedback (an "enhancement request") to Apple just a few days ago, asking that Amharic be readable across all its devices. I suppose somebody at Apple gets paid to read fringe feedback like this. Luckily, I don't need to rely on my iPhone to schedule my lessons. When I write to Lulit on my laptop, I copy and paste individual letters from the Amharic Wikipedia page until I have my entire message. It takes quite some time. So today I finally installed the Amharic Keyboard from http://keyman.com/amharic/. I was surprised that not only was it free, it also took less than a minute to install to my web browser. Ironically, you have to know the "right" transliteration of a word to get the correct spelling in Amharic. Thus, if I type the word "fidel" I get ፊደል, which is correct, but if I type "feedel," ፈእደል comes out, which is not. Nevertheless, the keyboard will save me loads of time. This Amharic keyboard is now conveniently accessible in my Bookmarks toolbar. During my most recent lesson with Lulit, after an absence of over five weeks, the ፊደል came up in an interesting way. I asked Lulit about the "Ethiopia Day" (ኢትዮጵያ ቀን) celebration she attended in San Jose back in early July, just as we were leaving for Curaçao. Despite having terrible seats with a view obstructed by a wall of speakers, Lulit said she enjoyed the day. A highlight for her was seeing (or at least hearing) her friend Wosene Worke Kosrof, an Ethiopian painter and sculptor who lives in Berkeley, receive an award for his body of artistic work. 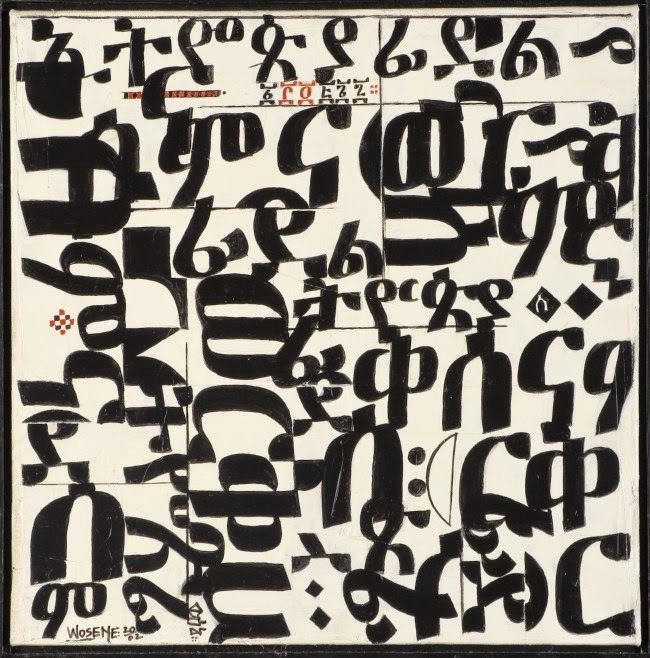 "the first contemporary Ethiopian-born artist to use the script forms – fiedel [yet another spelling!] 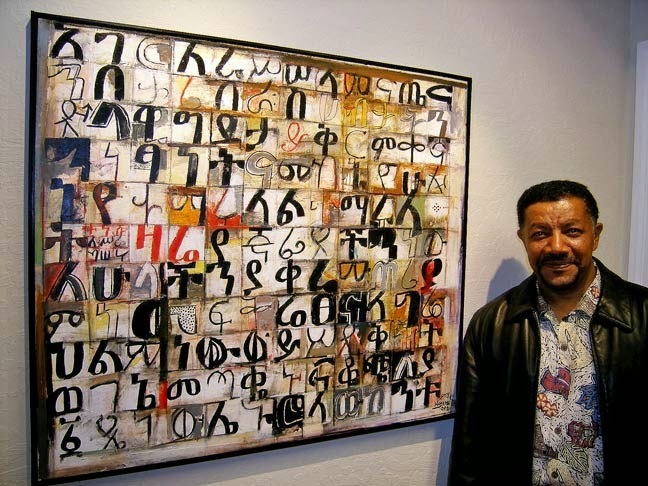 – of his native Amharic as a core element in his paintings and sculptures. 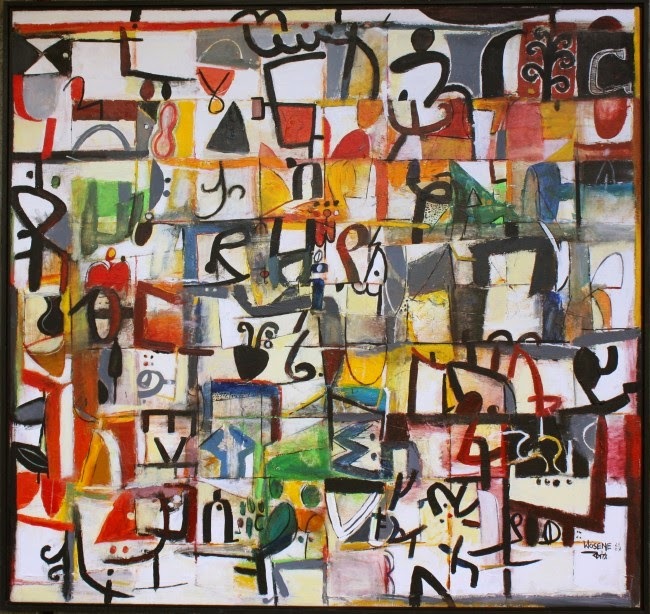 This recognizable ‘signature’ emerges from the way he elongates, distorts, dissects and reassembles Amharic symbols – not as literal words – but as images that speak for themselves in a visual language accessible to international audiences." Yet I am actually interested in the literal words Wosene uses, since it is a fun way to build my vocabulary and increase my fluency with the script. For instance, the painting above is clearly about New York. 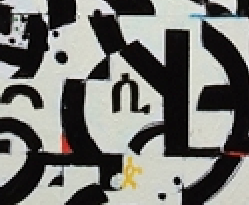 You can even see the word ታክሲ ("taxi") just left of center between the yellow and black checkered squares. Written on the bridge are the words ብሩክሊን ("Brooklyn") and አዋሽ ("Awash"), which, in addition to being a river entirely within the boundaries in Ethiopia, is a popular Ethiopian restaurant in NYC. In the blue section are the words ግም ውሃ ("bad smelling water"). I wonder if Wosene is implying he prefers life in the Bay Area, since the color of the bridge seems to reference the Golden Gate Bridge rather than any bridge in New York. "The more you look, the more you see." This was a favorite expression of a colleague of mine; she used to remind her teenage students of this 'truth' all the time. 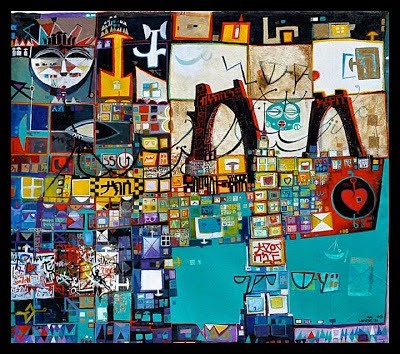 Another colleague who taught art would ask his students only two questions when he showed them a painting or sculpture: one was "What do you see? "; the other was "What else do you see?" I adopted these pedagogical techniques into my own teaching over time. Wosene has also worked with adolescents for a good part of his life, teaching them "The Pleasures and Danger of Learning to See." 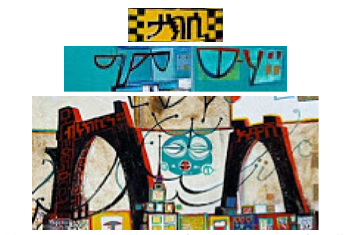 I even think he embeds the Amharic character ሲ ("see") in many of his paintings as a bi-cultural pun. Ethiopian Grammar. 2001. Acrylic/Canvas. 19"x19"
There are words and phrases like እናት ("mother"), ዘመን ("generation"), መሠረት ("foundation"), ሐገሬችን ("our country"), ኣብሮለማደግ ("together for to grow"), ዐንድነታችን ("our oneness") የኢትዮጵፍቅርምሳሌ (Ethiopia's love example), even መቃዠት ("to have nightmares"), which made Lulit laugh. In fact the line at the bottom reads ፊደልግርግርመቃዠት ("Fidel noisiness to have nightmares"). I can't tell if Wosene intends that as political commentary or a depiction of his own mind. But he definitely intrigued me. When I got home from my lesson, I immediately went on Wosene's website to see what his work costs. 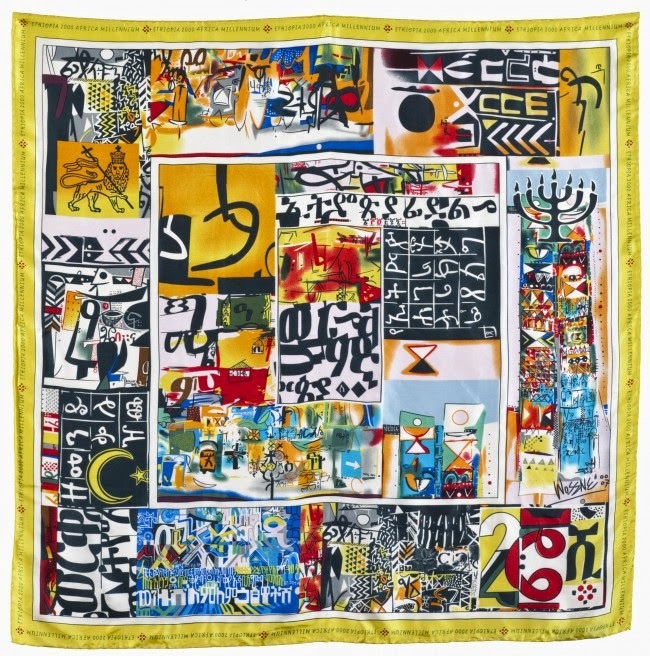 The offset lithographs are certainly affordable in the $200-400 range but I decided to buy his limited edition silk scarf for $40 (with free shipping!). It should arrive early next week. Perhaps this will add a splash of color to Suzanne's all-black outfits. Then I remembered we have a silk scarf of the Amharic Fidel, so I put it up in the window. I'm facing it now as I type. I'm hoping that the more I look, the more I will ሲ.
P.S. 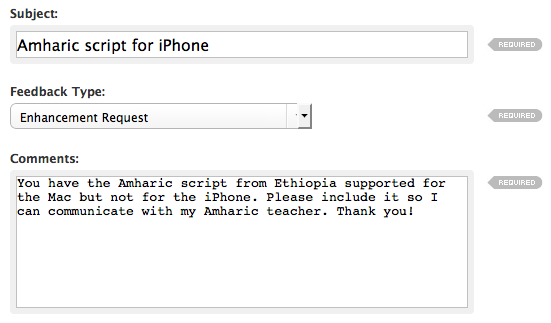 If you feel inclined, you can help by writing to Apple and requesting that the iPhone and iPad support the Amharic script. Just go to https://www.apple.com/feedback/, select the product (iPhone or iPad), and add your "enhancement request." 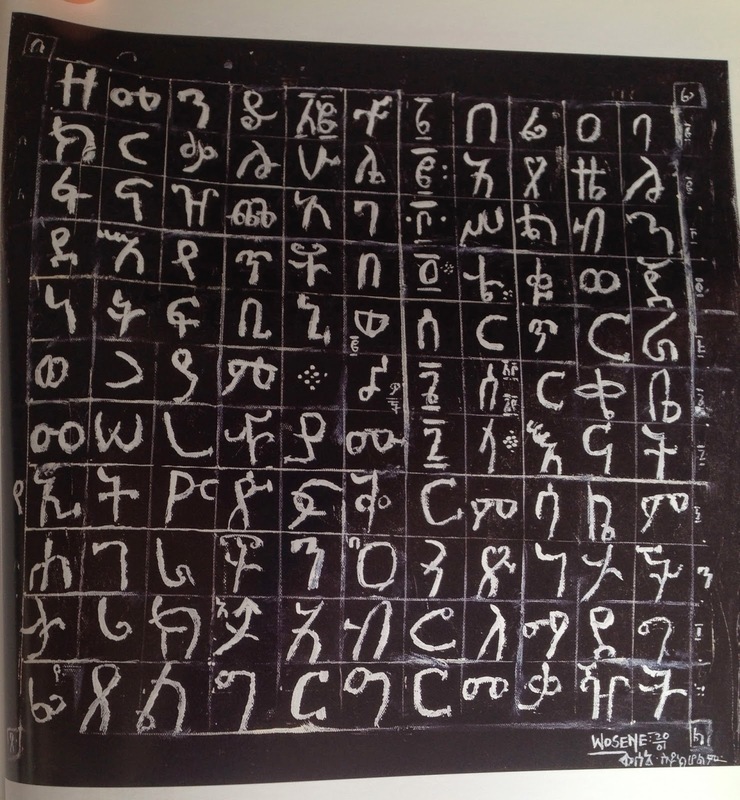 Could you please tell me Where you got the silk scarf of the Amharic Fidel?